"Hey little goldfish, where you going to?/ Little goldfish, let me swim along with you/Pretty goldfish, we could have a whale of a time/Put your fin in mine"
Some years ago, Saturday Night Live did a memorable skit called "The 1960s Movie." Within its five to six minutes, every cliché and trademark element of cinematic silliness that were the norm for the likes of beach party flicks, innocuous musicals, and teenage vehicles were crammed in. By the end of the decade this sketch parodied, audiences were gravitating toward more gritty, realistic fare like Midnight Cowboy and The Wild Bunch. Little wonder that Paramount's Hello Down There, a throwback to those swinging, lighthearted films of yesteryear failed abysmally at the ticket windows in 1969. However, nostalgia has a funny way of redeeming initial failures like this. Over the course of the last three decades, a small but loyal cult following has formed for this simple yet entertaining little film chronicling the adventures of the eccentric, appealing Miller family, who spend a month under the sea in a groovy hi-tech home. Add some cute dolphins, campy villains, dangerous sharks, a little bubblegum music (courtesy of the godfather of the genre, Jeff Barry of the Archies fame) and very special guest star Merv Griffin, you wind up with an adorably goofy slice of '60s camp. Fred Miller (Tony Randall, not looking a day older than the era of Will Success Spoil Rock Hunter?) is a researcher for a Florida-based underwater development corporation who's being pestered by his monster of a boss, T.R. Hollister (Jim Backus), over an expensive underwater home humorously dubbed "The Green Onion" that's just taking up space to the tune of nearly a quarter of a million dollars. Eager to take his architectural wonder out of white elephant status, he volunteers his family to serve as a case study to prove its worth. But wife Viv (Janet Leigh) is no swimmer and afraid of water, while teenagers Tommie (Gary Tigerman) and Lorrie (Kay Cole) are super bummed because their rock and roll combo, Harold and the Hang-Ups, are "this" close to being signed by timely named musical impresario Nate Ashbury (Roddy McDowall, looking like he borrowed ex-Beatle Paul McCartney's famed Shea Stadium uniform). But it's all for one as the family puts aside their cares and fears for papa to submerge beneath the waves with fellow Hang-Ups members Marvin and Harold (Lou Wagner, Richard Dreyfuss) coming aboard for the ride ("let's do a song in moments so crucial when the writers need to reconvene to come up with ideas for the next scene"). Meanwhile back on land, T.R. looks to foil Miller's momentum by sending fellow researcher Mel Cheever (Ken Berry) to a nearby undersea location to look for buried treasures and of course, make trouble for his competition. With its nifty sets, cool gadgetry that brings to mind The Jetsons appealing cast of familiar faces (also including beach partymovie regular Harvey Lembeck and future Facts of Life lead, Charlotte Rae) and catchy tunes (c'mon, I know many of you have been secretly humming Hey Little Goldfish and Glub, Glub, Glub to the bemusement of your friends for years), Hello Down There has aged amazingly well. Directed by esteemed television comedy helmer Jack Arnold (The Brady Bunch, Gilligan's Island), it feels more like an extended, bigger budget pilot at times, but the impressive underwater photography sanctioned by producer Ivan Tors, the man behind many impressive animal films and small screen projects of the 1960s (Flipper, Gentle Ben) drives Hello up quite a few notches in quality above similar films of its type. In addition to its now built-in retro stance, where else are you going to see Richard Dreyfuss trying to fake out riffs on a bass guitar he obviously can't play and helping Randall do battle with some troublesome sharks (holy foreshadowing, Batman!). Image Transfer Review: Sometimes, the most unlikely films bust apart with color to spare; such is the case here with a simply gorgeous transfer that scores on virtually every level. Facial tones are as close to perfect for a film of this age, sharpness is spot on and the color replication from the underwater digs to the sea photography is awe inspiring. I can almost guarantee every print of this film that's aired on network and cable has never looked this luminous. Audio Transfer Review: A well-mastered Dolby Digital Mono track that's mostly pleasing to the ears. Could have used a bit more oomph in the lower registers during the action and musical sequences (get down on that bass, Dreyfuss! ), but all in all, it's a couple of notches above merely serviceable. Extras Review: With most of the main principles sadly no longer with us, the lack of bonuses is forgivable. But couldn't the Paramount archivists have come up with at least the theatrical trailer? If anything, even if one exists in battered condition, it could really show just how impressive this new re-master is. 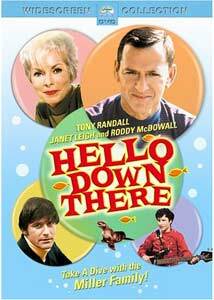 One of those "that'll never come out on DVD" rarities that actually had enough groundswell support to merit issuing, Hello Down There will delight both supporters and curio seekers. In addition to an excellent transfer, it's a terrific family film with an irresistible quirky allure that deserves to be discovered by a new audience. But don't blame me if you find yourself singing Glub, Glub, Glub in the shower.